Some Powys youngsters are going to sixth forms outside the county because they want "bright lights" and coffee bars, a senior councillor has claimed. Cabinet member Myfanwy Alexander said it was vital to know why pupils left Powys so provision could be planned. 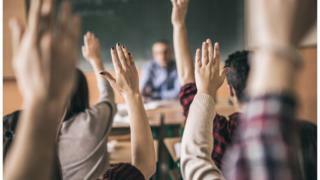 The comments came as head of education Dr Alec Clark warned some high schools in Powys could lose their sixth forms due to a lack of students. He said it was not sustainable for all 12 high schools to offer every subject. The cash-strapped authority is seeking to save £12m after setting its budget last month. A survey of 16-to-18 year olds in the largely rural county about their further education decisions runs until Sunday, according to the Local Democracy Reporting Service. "What is stark to me is how few sixth form children we have in a geographic area that is 26% of the whole of Wales," Dr Clark told councillors. He said the figure of just over 1,000 was "a very small number of children to be delivering A-levels to across 12 sites". Official government estimates suggest there are more than 3,000 youngsters aged 17 and 18 in Powys. The local authority believes about 200 youngsters from Powys are attending sixth forms outside the county. Ms Alexander said: "Hereford is a big draw, in the south they go to Neath, and in my neck of the woods they go to Shrewsbury or Oswestry to college. "Sometimes it's because the subject they want is there, sometimes they go because they are fed up in school and want to be in a college environment. She added some youngsters had told her they wanted to go to the "bright lights within walking distance of Costa". "We need to help our youngsters fulfil their potential, but we need honest data about why they make the choices they do, and we can use that to drive the choices we need to do."